Inspired by a geometric model of the fourth dimension where space and time are unified—The Hyper-Cube adapts the concept into a geometric design expression of a cube within a cube. Translating the four-dimensional form into a three-dimensional object expands the boundaries of our perception of space, and blurs the line between the conceptual and the functional. 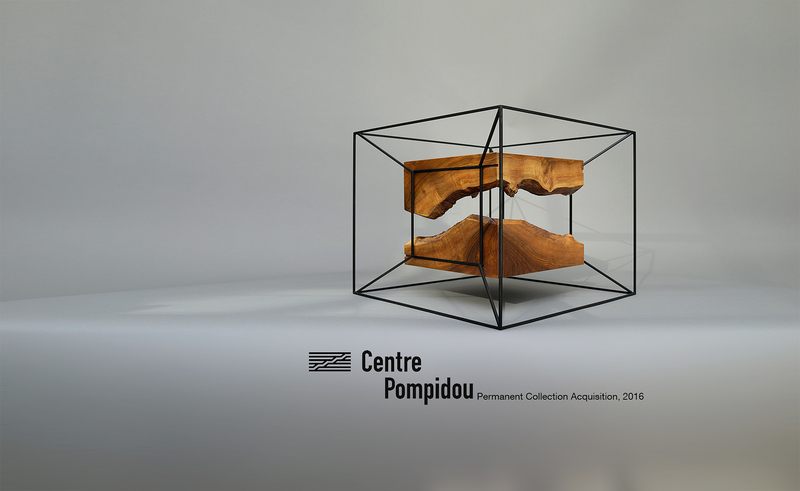 In this initial series of four unique designs—one of which was acquired by The Pompidou Center in Paris for their permanent collection in 2016—a blackened steel hyper-cube envelope surrounds a walnut cube, accentuating its duality: the materiality of the 200-year-old American walnut and the immateriality of the geometric theory that inspired its form. The perception of form and dimension is heightened with an origami-like construction of the curving drawer faces, where a single wooden slab seems to have been “folded” to form each half of a bisected cube, the natural edge of the slab creating an organic fissure between the removable drawers. The Hyper-Cubes, designed simultaneously by Aharoni in a set of four as a reference to the square, were conceived in 2012, and completed in 2014. The Hyper-Cube exemplifies Aharoni’s design work through its combination of natural and industrial materials; the integration of geometric form and functional object; the contrast of wide and slender silhouettes; the juxtaposition of warm and cool palettes; and the integrity of craftsmanship and detail.